In 1995 during one of the worst winter storms on record, 100 mile-per-hour winds tore through San Francisco, toppling countless trees, ripping off roofs and leaving one of the city's most beloved landmarks in tatters. 40% of the glass tiles that once sheathed the Victorian-era Conservatory of Flowers lay smashed on the ground, several wood arches were damaged and a portion of its collection of rare tropical plants was lost. Inspecting the building after the storm, Department of Public Works (DPW) officials despaired to find that the years of extreme moisture both inside and outside the building had rotted the infrastructure extensively. It was clear that something had to be done to save this fragile, decaying glass palace. But what? "This was a totally unique animal," says Edgar Lopez, a project manager for the City and County of San Francisco's DPW Bureau of Architecture. "Here was this pre-fab, one-of-a-kind 19th Century greenhouse and no existing drawings. No one knew how to put the building back together." Indeed little was known about the construction of the building, and its history was clouded with legends. Records show that James Lick, a wealthy businessman who made his fortune in real estate, ordered the greenhouse for his Santa Clara Valley estate. Unfortunately, Lick died before it was ever erected. Put up for sale by his trustees, the kit was purchased in 1878 by a group of prominent San Franciscans who offered it to the City of San Francisco for use in Golden Gate Park. The gift was accepted by the Park Commission, who hired Lord & Burnham, a greenhouse manufacturing company from New York, to build it. Beyond this, however, the facts become more confused. It is unclear whether the components were shipped from Europe or manufactured in California. Significant use of old-growth redwood in the building's infrastructure supports the theory that some portion of it was constructed here on the West Coast. Some say these sections were lost en route from Europe when they and the heating boiler went down with their ship in a storm. Without any substantial documentation, the rehabilitation team was not even sure the kit would come apart. The decision was made to develop a testing phase, which involved the removal and reassembly of a 900 square foot section of the West Wing. Each component was separated to determine the assembly technique, and the various building materials were analyzed to determine their age, composition and integrity. "Like a dissection," says Jim Kennedy, the project's construction manager. "It was the best way we could think of to guesstimate what would need to happen in the rest of the building." When the analysis was complete, the team was faced with two key issues that would determine the course of the rehabilitation: what type of lumber to use and whether the building should be put back exactly as it was or built as it should have been. When the three bays of the West Wing were dismantled, it became clear that the building was a hodge-podge of different types of lumber including ponderosa pine, sugar pine, Douglas fir and old-growth redwood. Except for the redwood, these were all decaying at varying rates, particularly the fir. The mullions were especially compromised at the attachment point due to rusting square nails. "It was like amoebas had been eating the wood," says Lopez. The project's engineers were recommending pressure-treated new growth redwood to replace these rotted pieces, but the City was determined to find a more environmentally friendly material. A suggestion to use recycled old growth redwood was nixed by the engineers, as it would be nearly impossible to determine the structural load. So, the decision was made to use buckskin logs, trees that fall naturally or are abandoned by logging companies. The engineers were only willing to agree to this if each piece was hand-graded to determine its structural strength. The City brought in a pro, Charlie Jordain, who hand-graded each of the 2000 milled pieces, which were also weighed for density and structural integrity. "I think I weighed at least half of those twenty-footers myself," says Kennedy. Perhaps the biggest decision that the team faced in the rehabilitation project was the question of historical accuracy. In the first phase of the project when the three bays were dismantled and reassembled, the team was determined to replace everything exactly where it had been, imperfections due to structural settlement and all. But midway into the assembly, it became clear to everyone that "as it was" was not as good as "how it should be." The roofline had a wavy look and the glass was misaligned. What's more, the whole thing was off square 2 inches. Discussions began immediately with Christina Wallace, FEMA's representative for federal oversight of preservation. Eventually a decision was agreed upon to group pieces like the mullions with their arch as opposed to replacing each in its exact, original location. Adding to the complexity of the project was one very old philodendron. The Conservatory's century-old tropical giant could not be moved. Several other very old and valuable species also needed protection from the mayhem. So, in Phase One when the team was reconstructing the three bays, they also tested temporary enclosures for plants. The primary issue was heating. These plants would be irreparably damaged in sustained temperatures of less than 58 degrees. A fin tube heating system was devised, but concern for the plants was so high that four team members including Kennedy, the Conservatory's curator, and two reps from the general contractor wore pagers that would start to beep if the temperature dropped below 58. Once the pagers signaled the team, they had one hour to restore the temperature in the enclosure. "It happened three times," says Kennedy, shaking his head thoughtfully. "During one storm, a eucalyptus came down right in front of us as we were running down the road to the enclosure." $25 million dollars later, rehabilitation of the Conservatory is winding down, due to be completed on time in September. Soon the $4 million worth of new exhibits will be installed and the plants moved back into their home. "We have created plant heaven," says Lopez, "This building is like my baby -- you can't imagine the sleepless nights! But I'm so proud to be a part of the rehabilitation of a landmark that is so loved by this cityŠto be associated with something so unique and beautiful. I still drive by on weekends and just look at it." 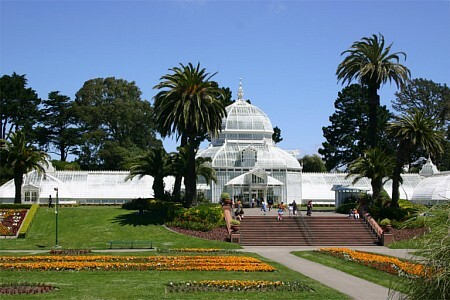 The Conservatory of Flowers has been a San Francisco icon since it was erected in 1879. The 12,000 square-foot Victorian greenhouse is the oldest existing public conservatory in the Western Hemisphere. The rehabilitation of the Conservatory began with spontaneous donations from private citizens after the 1995 storms. Designated as a city, state and national historic landmark, the Conservatory of Flowers is an official project of Save America's Treasures, a project of the National Trust for Historic Preservation. The Conservatory rehabilitation is managed by a partnership between the San Francisco Recreation & Park Department, Department of Public Works, and the non-profit Friends of Recreation & Parks, which is leading the fundraising campaign. Scot Medbury has been involved in the curation, cultivation and interpretation of botanical collections for twenty-five years, having held challenging appointments at botanical gardens in California, the Pacific Northwest, Great Britain, New Zealand and Hawai`i. His broad knowledge of the horticultural, ecological and design characteristics of temperate, subtropical and tropical plants has helped to inform the master-planning of botanical gardens throughout the West, where a vast native and cultivated flora, diverse gardening climates and complex land-use history challenge designers to create ecologically appropriate and regionally sensitive landscapes. Scot began his horticultural career in the Pacific Northwest, working in the nursery and display gardens at Tacoma's Pt. Defiance Park and in the Edwardian-era conservatory in Wright Park. He went on to serve as assistant horticulturist and nursery manager at the National Tropical Botanical Garden in Hawai`i, as an education and visitor-services coordinator at Seattle's Washington Park Arboretum, and as gardens-wide horticulturist and curator for the 5-garden Honolulu Botanical Gardens system. Assignments along the way included management of a heritage-tree survey for New Zealand's historic Pukekura Park, and a stint as a gardener at the royal gardens at Windsor for Great Britain's Crown Estate Commission. Medbury holds two degrees from the University of Washington: a bachelor's degree in international studies with an emphasis on Russian language and culture, and a master's degree in forest resources from the UW Center for Urban Horticulture. His thesis project identified and analyzed the antecedents for Seattle's Olmsted-designed, taxonomically arranged arboretum plan, and helped to stimulate his enduring interest in the design history of American public gardens. 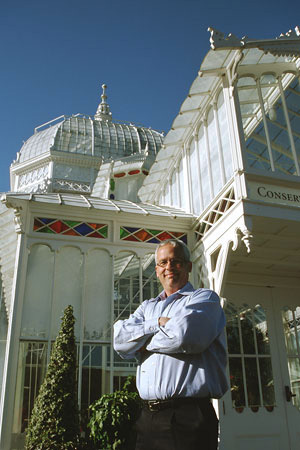 Before assuming his current position in San Francisco's Golden Gate Park, Scot pursued a Ph.D. degree from the University of California at Berkeley, advancing to candidacy with a research program focused on the role of botanical gardens in plant genetic conservation and on the ecological and cultural issues surrounding plant-introduction programs. In 2004, he received the professional citation from the American Association of Botanical Gardens and Arboreta for his contributions to public gardens in North America. At both the Conservatory of Flowers and the San Francisco Botanical Garden at Strybing Arboretum, where he has been director since 1999, his priorities have been to increase the use, enjoyment and understanding of these facilities by all San Franciscans, and to bring additional support for maintenance and curation. "Our challenge here is to respect what we already have," he says, "while continuing to enhance the diversity of both the plant collections and the audiences who come here to learn about them." Steering committee members have set up a yahoo group for OWA members. The value of this emailing structure is the ability to reach the entire OWA membership with one email&emdash;ask a question, solicit help, find someone working on a similar issue as you, use it as an on-line bulletin-board. It's an easy way to communicate and circulate information. If you're interested in joining, please contact Hana Mori. Don't forget to mail in your dues. The annual term for OWA membership runs from February 1st to January 31st of the following year. 2005 dues are due. If you would like to investigate opportunities at the University, please contact the Contract Administration for Professional Services, Juanita Purvis, at 434.982.5943 or by email at jmp5k@virginia.edu. The San Francisco Bay Area Chapter of the National Association of the Remodeling Industry (NARI) announced winners of the annual REMMIES Awards honoring excellence in remodeling. A prestigious panel of judges reviewed a record number of entrants and selected Mahoney Architects for a top award for remodeling in 2004. Mahoney Architects were also recognized by the organization for winning more awards over the past ten years than any other design firm. The firm is celebrating its 20th anniversary this year. Participation in the OWA meetings requests a $3 donation from members and a $5 donation for non-members unless otherwise noted on the calendar. It was pouring rain and the roads were flooded, but nothing could keep two dozen people from attending Orit Yanai's illuminating, informative and fun lecture. She started with a personal introduction, talked about the history of modern plaster wall finishing techniques, and continued into a discussion of how she recently started using a non-toxic earth plaster from New Mexico. Even considering the benefit of how much healthier the non-toxic plaster is to her clients as well as herself, she said "I wouldn't be using it if it weren't an absolutely beautiful material." She proceeded to take out some fresh clay and demonstrate the technique on a prepared wall section. Around the room were many examples of finished walls, in many different beautiful colors and finishing/sealing techniques. Orit ended by answering many questions from the designers, contractors and curious audience, on topics ranging from short-term economics to long-term stability and maintenance. Here are some images from that night. Thank you to Sean Morrison for these photos! Orit prepares a batch of plaster. Some more attendees, with sample walls behind them. 1.1 Discussion of procedures, format for miniutes, agenda organization and content. Review of Minutes from January transition meeting: Approved as corrected (spelling, research on board insurance). 1.2 Lucia Information Coordinator Update. Lucia has reviewed Bill Hockers work (very impressive) and is getting flooded with emails, and will probably have to set up new account for OWA communications. It is OK for her to delete emails relating to dues payment. Policy of “reply-to-all” on messages will ensure that both Charlayne and Lucia know who has responded to which. Lucia is to call Bill Hocker to discuss back-up plan in case he is out of town or indisposed, and to find out if OWA owes him money for solving the bulk-mail problem. 1.3 Newsletter Update: We note that it went out, but would have preferred that it contain some information about this meeting. No information (more than 300) who have not renewed since 2011 or before. We keep lapsed members informed because sometimes that inspires them to rejoin. Charlayne There was discussion of whether or not to prorate dues for new members paying late in 2013. Consensus was to credit those who pay after annual business meeting (usually about November 1) to get credit for following year. Charlayne to discuss with Judy Rowe to be sure this is reasonable/feasible. 1.5 Lucia Healthcare Update: Members signing up before May will be enrolled in time to coordinate with the Affordable Heathcare Act. Anyone with questions should contact our broker, rather than Janet. (name of broker?). April meeting should probably have an announcement about this. Lucia to put policy information on website (she may need to clarify this with broker). 1.6 Mentoring Event was a big success. Charlane has lots of pictures see item on Pods below. 1.7 Lucia Online Calendar: Esin asked for clarification of how calendar gets updated and by whom. This has been somewhat unclear in past. Charlayne put a March event on the calendar without consulting the Program Coordinators. In future all programs need to be cleared with Program Coordinators. Her event can be a special program, date to be determined. Pod events are seldom easy to find. Need to reach out to Pods to get information about their events on online calendar to avoid conflicts. Pods should send calendar information on their events to Patty and Carolyne who will post them on the online calendar. Pod autonomy should be preserved for event announcements which are separate from calendar, and could include reminders. Responsibility for these Pod event announcements and RSVP’s should remain with Pods. Responsibility for annual events and Steering Committee meetings remains with Program Coordinators Lucia needs to contact Pods and confirm this policy with them. a. March 18: Thomas Church’s house and garden in San Francisco which will be hosted by Courtney Damkroger, historic preservation architect who owns it. b. May 20: Aging in Place, an event location to be somewhere where South Bay members can conveniently come by train/bus. Tentatively in San Francisco, SOMA. Some additional ideas might be special events, or perhaps one of them them could be planned for January 2015, thus avoiding gaps in future event planning during transition to next years Steering Committee. 1.9 Esin Public Relations Update: Esin will provide SC with a list of goals for PR. Need policy on who has access to social media. Need single source with unified voice. Need consultant specializing in light, short content. The 2014 budget has $3,000 for this..Esin will find candidate (s). She will also find a graphic designer for Logo and will present one design for approval at this years business meeting. 1.10 Allison Policy & Procedures Coordinator: 1) Digital conference capability: Allison has researched Webex and Go-To-Meeting for emergency digital meeting procedure. Webex seems best suited, is cheaper ($24/monthly, or $19/month annual) and has a $14 free trial which we agreed to try the first time we need a digital conference,.2) Insurance: Allison is getting quotes on board insurance for SC members and officers. Bi-laws already indemnify us, but to protect OWA/DP’s assets, insurance would be good. She has already talked to State Farm (who holds one of our policies and could add this one). Allison will get other quotes including one from a not-for-profit insurance company for non-profits. The assembled congratulated Charlayne on her delicate condition! She is due in September. Meeting adjourned a bit after 5:00 PM. Lucia picked up tab and will get reimbursed from Judy.